many thanks for task 6. Below you can find reflections on Task 6 and instructions for Task 7. The task made me think a lot about the routes I am taking and my attitude to them. I realise that a route is a means to get from A to B and time is of essence. The route, however pleasant, needs to be completed in the least time possible. The key constraint that has to be satisfied then is time and every possible change in the route I could think of entailed making the route taking more time. The task also made me think about Mithila Folk Painting. The practice originates from Bihar, India, but when I was in South India I remember seeing women, at the break of dawn, drawing with chalk intricate shapes in the front of their house. 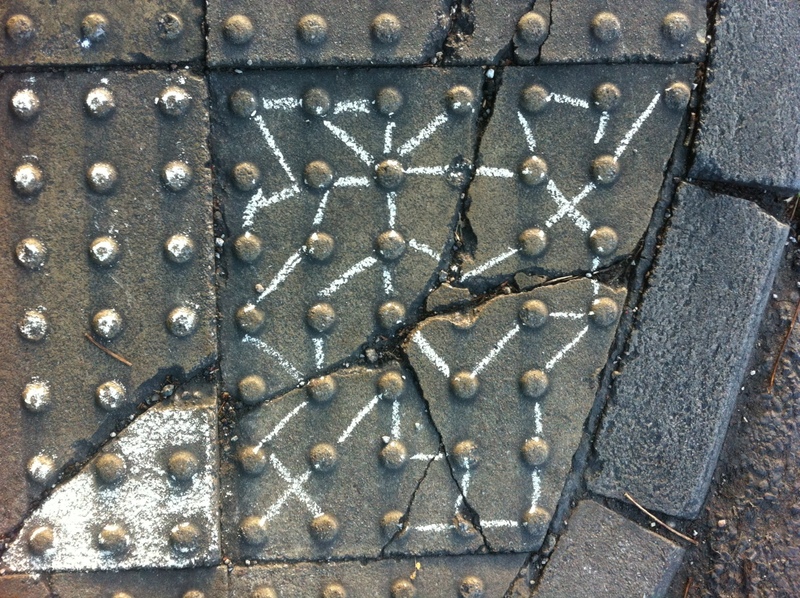 As I understand it, the shapes were drawn as an offering and a means to ward off evil. I thought about these women and whether time was also of essence to them, in the same way it is for me. On a short and very familiar route, I put the timer on my phone to ring every 3 min. The moment the timer goes off, I have to stop and draw something on the exact place I stopped. 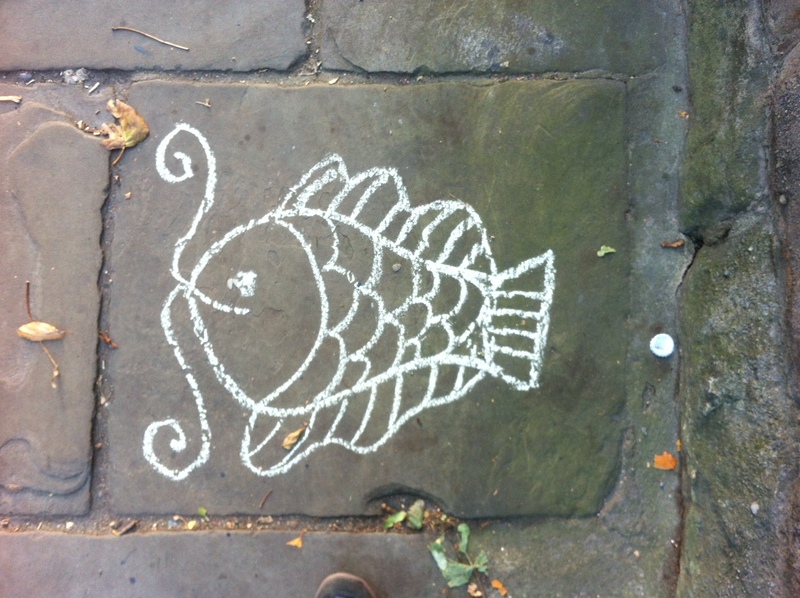 The first thing I draw is a fish, as done in Mithila Folk Art, but at subsequent stops I play with the texture of the paving stones. At the last stop, I am facing a weak sun, that is just breaking from the clouds. I wonder if my drawing is an offering to this timid autumn shining. Later in the day I do the same route with the 5 year old. I show her the drawings and tell her that she can add to them and/or do other ones. The constraint this time is this: we do not leave the place until the 5 year old suggests so. 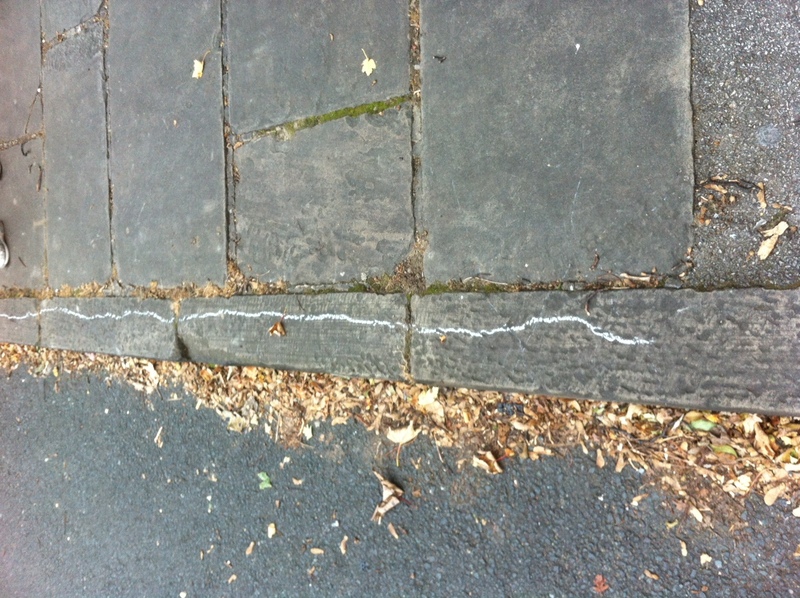 More than the self-consciousness of stopping chalk-in-hand on a really busy road, the suspension of cajoling/instructions/threats to ‘let’s go’, ‘move on’, ‘come on’ leaves both of us confused. The 5 year old looks at me and waits for the usual phrase. I have to stop my self every other second from actually saying those all too familiar phrases (at one point the words come out out of sheer habit before I can stop myself). When I do yoga, the move from one position to the next feels as familiar as the route I took earlier in the day. If anything, yoga is about taking time and making it one’s own. But is time of essence here to? Or is every stop, every position an offering? Do a set of standing postures, Tadasana, Vrksasana, Trikonasana, Virabahdrasana I and II, all of these poses can work quite well. Immediately after write a piece of text on standing. What it means to you to stand? What does standing mean? How is the word ‘to stand’ used in language? Then do a set of recuperative poses, preferably with support, such as Badokonasana, Supta Virasana, Savasana. Write a piece of text about when and what makes you feel supported. See if you can use passive voice.